This Saturday marks the 50th anniversary of the JFK 50 Mile, one of the biggest and oldest ultras, and one responsible for bringing many newcomers into the sport of ultrarunning. Beginning as a Marine walkathon created in 1963 by President John F. Kennedy to test the military’s fitness, the challenge was for Marines to be able to walk 50 miles in a day, as was first laid down by Teddy Roosevelt in 1908 in an executive order based on the premise that maintaining such speed was essential in times of battle. After Kennedy’s announcement, 50-mile challenges were taken up by military personnel, and even some civilians in several places around the country. As the idea quickly caught on, the challenge even spread as far as England. However, the JFK 50 is the only one of these events that has survived the test of time. Buzz Sawyer, the race’s first director ran the course in March of ‘63 with fellow members of the Cumberland Valley Maryland Athletic Club. With this first running, a tradition was then born out of the challenge to make better time on the course each year. Almost from the start, the JFK 50 Mile began making history. In the late ‘60s, just as distance running was becoming more popular for men, women began taking it up as well. In 1968, Donna Aycoth became the first woman to run the course, just 11 months after Kathrine Switzer made history by running the – then all-male – Boston Marathon. Aycoth tied for second place, and continued to participate in the JFK 50, claiming the women’s championship six times consecutively from 1968 to ‘73. Sawyer continued as the race’s director for 30 years, then passed the torch in 1993 to Mike Spinnler, the race’s current and only other director. The course itself has not deviated from that first run Sawyer and his fellow club members took in ‘63. Runners line up to begin the horseshoe-shaped, point-to-point course around sunrise at 7 am in the tiny town of Boonsboro, Maryland, fidgeting in the morning chill on the main road as the town slowly wakes, lights appearing in one or two shops; many of its residents already lining the streets to cheer the runners on. After a couple of miles of paved road, flat at first, the course quickly climbs to the top of South Mountain to join the Appalachian Trail in an area rife with American Civil War history. The first five to six miles climb 1,172 feet from the pavement onto rocky, technical, singletrack sections of the AT, which then travels across the mountain’s ridge. After roughly 15 miles, the course drops precipitously through a series of steep, rocky switchbacks and down to the Chesapeake & Ohio Canal towpath to follow the Potomac River for 26 miles, finally turning again onto pavement, but remaining on relatively gentle rolling hills for the last 8.4 miles to the town of Williamsport, Maryland. Despite the large number of civilians from all ages and walks of life who participate every year, the race remains, in essence, a military race, and attracts a good number of military personnel, who often run in teams. Winning military teams are awarded the special Kennedy Cup. In addition to the military aspect, the race differs from many 50-mile ultras by its large field size of 1,000+ runners, and in that much of the midsection of the course is run on the flat C & O Canal towpath. This flatness attracts a lot of first-time ultrarunners, though it is said by some to pose as much of a challenge as courses with more elevation climbs. It also makes for a rather social race for many in that the field is often thick with runners who find the long, flat stretches relaxing – even monotonous after the highly technical singletrack AT. Conversations are struck, friendships form, and many runners find themselves forming their own traditions, returning to run the course year after year, maintaining friendships that live only during the running of the JFK 50 Mile. Anna Bradford has been running the JFK 50 every year since 1995. “I still run it because I, like most runners, am hooked by the streak and the meaning I put on this particular streak. And because the actual event is typically amazingly joyful for me,” said Bradford. In addition to participating, Bradford is responsible for introducing many first-time ultrarunners to the race, and organizes teams of runners and volunteers for the Reston Runners, a club she belongs to in Reston, Virginia. Spinnler looks back humbly on his 20 years as the JFK 50’s director, and then to the race’s future, which from the present, appears secure. If you’ve ever run JFK, we’d love to hear your stories to mark the race’s milestone running! Dani Seiss is a runner, certified coach, musician and writer who works for The Washington Post. 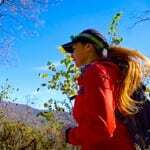 She has been running ultras since 2009, but has been running long in the mountains of Appalachia since the late 1980’s. She blogs about her running adventures and misadventures at danirunner.wordpress.com, and occasionally writes about running for The Washington Post. Currently, she is working on a book about how running saved her life, and how it can change yours. Great article. I have many fond memories of JFK. Growing up, my family celebrated JFK as much as, if not more than, Christmas. I had heard of Weaverton Cliffs and 38 Special the way most kids hear of Yankee Stadium. I remember waiting with glass bottles of Yoohoo for my uncle to come along to get (I was too young to remember, but I guess this was before aid stations?). Flash forward and in 2008 I got to run every step of the race with him on his 30th completion of the race. In 2009, both of my brothers, my uncle and I finished the race to make it a family affair. I've run better races and more attractive courses, but JFK will always be a favorite. And Duane Rosenberg will be running his 34th JFK (32nd straight) on Saturday. Congratulations to Duane! I will be tackling my second JFK after a very successful run last year. Should I be able to complete the course this year, I know next year I will be "hooked by the streak" much like Anna Bradford mentioned in the article. Perhaps some day I can have a streak like your uncle, too. For a variety of reasons: the time of year in rural Maryland, the proximity to the water, the number of repeat runners, the community involvement of this race make it my Turkey Trot of ultras—that feeling of familiarity you have when you think of the Holidays and you identify with a smell, a crispness in the air- I have that for the JFK course and race. It will be my 23rd ultra and my 3rd time doing this race. I hope to one year get a 500 Mile Finisher sweatshirt for 10 years running JFK, even if they're not consecutive. Jamie, your comment came about 90 minutes too early. :-) We'll be providing live tracking of the JFK 50 leaders. I'm not aware of tracking for further back in the field. Well then, here's hoping Trent's among the leaders. I'm curious to see how he does in his first ultra.